The Looking Glass was originally drawn by William Heath (ca. 1795-1840) while based in Glasgow from 1825 to 1826. The satirical newspaper was revived in 1830 by publisher Thomas McLean (1788-1875) under the title McLean’s Monthly Sheet of Caricatures or The Looking Glass. Artist Robert Seymour (1798-1836) replaced Heath as the chief contributor and turned out hundreds of caricatures, large and small, colored and uncolored, to meet the ridged monthly deadlines for the next six years. Working primarily in lithography, Seymour was also producing weekly drawings for Figaro in London, edited by Abbott à Beckett and later, Henry Mayhew. 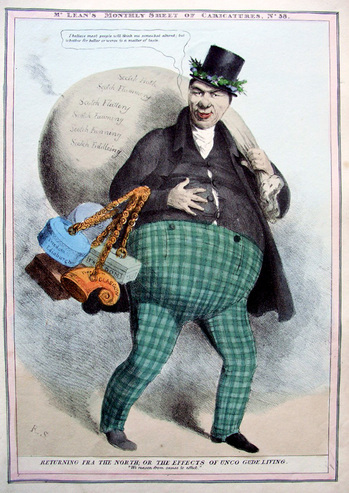 The caricature depicts Scottish judge and publisher Lord Jeffrey (1773-1850) who edited the Edinburgh Review from 1802 to 1829. Jeffrey was elected to parliament in 1831, living primarily in London, and introduced the Scottish Reform Bill in 1832. Two years later, not long before Seymour drew this image, Jeffrey was named Lord Jeffrey and returned to Scotland to served as a judge. The words “Unco Gede” are a Scottish term for exceptionally good or strictly moral. Jeffrey had a reputation for his strict morality, which may account for the reference.